There are numerous tests and assays available that are utilized to aid in bacterial identification in a variety of settings. Chemical assays used for bacterial identification utilize various components of the microorganisms including structural, cellular and metabolic indicators. Radioisotopic methods include the use of radioisotopes to help identify specific metabolic pathways utilized by bacteria by tracking uptake and breakdown of specific nutrients labeled with radioactivity. Micro-electrodes are commonly being used in bacterial identification, specifically for pathogenic bacteria, as a means to identify biological components in a variety of environments by combining with bio-sensors. peptidoglycan: A polymer of glycan and peptides found in bacterial cell walls. Within the field of microbiology, there are specific tests or assays utilized to quantitatively and qualitatively measure microorganism components. These assays are often utilized to aid in bacterial identification. Three major types used for this purpose include chemical assays, radio isotopic methods and the use of micro electrodes. The following is an overview of these methodologies. Chemical assays are utilized to identify and determine chemical components within a microorganism. Many of these assays test for specific cellular components and may have overlap with chemical analysis, which focuses on exact chemical composition. Examples of chemical assays include the classic test for Gram-positive or Gram-negative bacteria via Gram staining. Gram staining is utilized to differentiate bacteria into either of these Gram groups. The Gram staining technique is based on both chemical and physical properties of bacterial cell walls and tests for the presence of peptidoglycan. 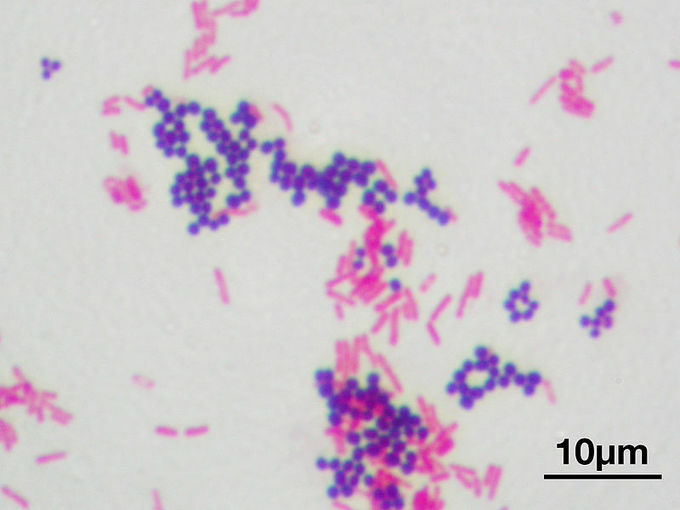 Gram Staining: An example of a chemical assay used for bacterial identification. The O-F test is utilized to determine the way in which a bacteria is capable of metabolizing carbohydrates such as glucose. The two major mechanisms from which bacteria can obtain energy include oxidation of glucose and lactose fermentation. This specific assay identifies which method bacteria use by cultivating bacteria in various conditions. The process of hydrolysis is characterized by the ability to chemically split a molecule by the addition of water. There are numerous tests utilized in bacterial identification which involve testing for hydrolysis of specific substances. These tests include hydrolysis of starch, lipids, casein and gelatin. The basis of these tests is to identify and determine if a microbe has the proper enzymes and molecules to breakdown and use these specific molecules as sources of energy for cellular growth. Electrodes are characterized by a system of electrical conductors that are used to make contact with a non-metallic portion of a circuit. In regards to microbiology and bacterial identification, micro-electrodes are commonly being utilized to identify pathogenic bacteria in numerous settings. The micro-electrodes have the capability to function as bio-sensors and detect specific biological components of microbes.